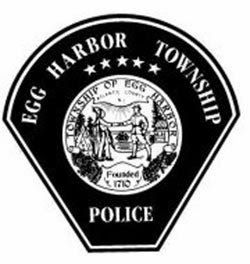 Egg Harbor Township Police have released their Police Blotter for the week of February 4, 2015 to February 11, 2015. Arrests consist of shoplifting, DWI, drug charges, and harassment. Joseph J. Erickson, 32, of Pleasantville was arrested Feb. 4 by Detective Scott Hiltner and Officer Curtis Ware and charged with shoplifting. Troy S. Helduser, 38, of Egg Harbor Township was arrested Feb. 4 by Officer Brett Fair and John Beattes and charged with shoplifting. Steven J. Adams, 42, of Egg Harbor Township was arrested Feb. 4 by Officers Joseph Coady and William Burns and charged with possession of a controlled dangerous substance, tampering with evidence, possession of a controlled dangerous substance and failure to surrender to law enforcement. Lori A. Matus, 43, of Egg Harbor Township was arrested Feb. 7 by Officers Shane Gilson and Katrina Cantell and charged with driving while intoxicated. Dominic A. Giannini, 41, of Hamliton Township was arrested Feb. 8 by Officer Gary Johnson and charged with fugitive from justice. Brendan D. Branca, 20, of Egg Harbor Township was arrested Feb. 9 by Officer Brian Keane and charged with possession of marijuana and drug paraphernalia. Christopher B. Cox, 29, of Egg Harbor Township and Amy E. Zelena, 29, of Galloway were arrested Feb. 9 by Officers William Peterson and Scott Nell and charged with simple assault. Zelena was also charged with harassment. Stephen M. Jacobs, 32, of Egg Harbor Township was arrested Feb. 10 by Officers Joseph Griffiths and Ernest Dunson and charged with possession of marijuana and hindering apprehension. Heath C. Harris, 38, of Millville was arrested Feb. 6 by Officer Shawn Mensch and charged with shoplifting and possession of a hypodermic syringe. Brianna M. Cadira, 19, of Egg Harbor Township was arrested Feb. 11 by Officer William Burns and charged with driving while intoxicated and possession of a hypodermic syringe. Abner Quinones-Coreas, 22, of Atlantic City was arrested Feb. 11 by Officer Patrick O’Hagan and charged with possession of marijuana. David L. Snyder, 18, Egg Harbor Township was arrested Feb. 10 by Officer Brett Fair and Paul Janetta and charged with false public alarm and improper behavior. Timothy U. Tolbert, 19, of Egg Harbor Township was arrested Feb. 11 by Officer Michael Keeping and charged with conspiracy to commit burglary and receiving stolen property.